Get the low-down on riding the Rapid in Shaker Heights. 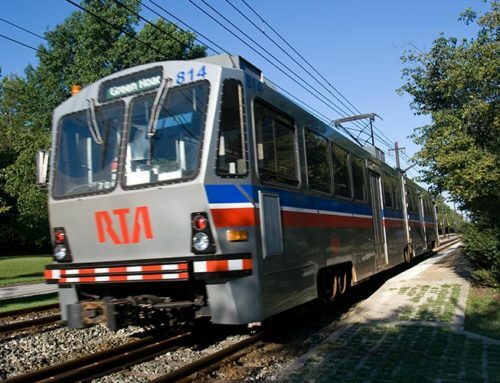 There are two Rapid lines running through Shaker: the Blue Line, which runs on Van Aken Boulevard between Shaker Square and the terminal at Warrensville Center Road, and the Green Line, which travels along Shaker Boulevard between Shaker Square and the terminal at Green Road. 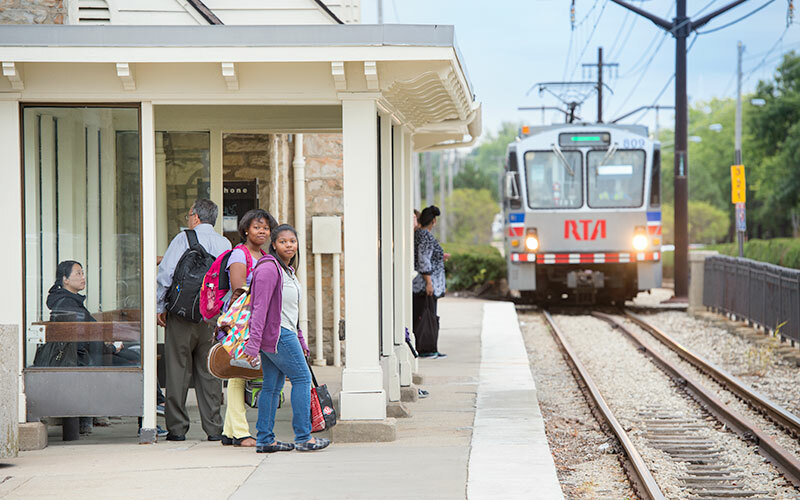 Rapid stations are available every few blocks on both Van Aken and Shaker boulevards, within easy walking distance from most neighborhoods. Most stations on the Blue Line offer free, pull-in parking. On the Green Line, only the Green Road and Warrensville Center Road stations have parking. Bike racks are also available at many Shaker Rapid stations. You can get to plenty of places in Cleveland using the Rapid. The Green and Blue lines will take you through the East Side of Cleveland to Tower City at Public Square; the Blue Line continues on from Tower City as the Waterfront Line (with stops at Settlers Landing, the Flats, and Browns Stadium). Riders can also transfer to the Red Line (at Tower City, but also at E. 55th and E. 34th streets), which runs up to University Circle and East Cleveland in one direction and Ohio City and eventually Cleveland Hopkins International Airport in the other. From Tower City, riders can also access one of the RTA’s trolley services (there are four), which travel between most major attractions downtown. Monday to Friday. The Blue Line runs from 4 am to approximately 1 am, with rush-hour trains available every 10 minutes, then switching to every 30 minutes during off-peak hours. The Green Line runs from about 5:30 am to 12:30 am, again with rush-hour trains departing every 10 minutes, then switching to every 30 minutes. Saturdays, Sundays and Holidays. Trains on both lines run from about 4:30 am to 1 am every 30 minutes. 1. Decide which line you plan to ride and where you plan to board the train. Again, the Blue Line runs along Van Aken; the Green Line along Shaker Boulevard. 2. Determine which direction you are headed. West is for trains headed from stops in Shaker Heights to Shaker Square and then to downtown Cleveland (Tower City/Public Square), with stops in Cleveland proper between Shaker Square and Tower City. East is for trains headed from Tower City/Public Square to Shaker Square and into Shaker Heights. 3. For westbound travel, you can pick either the Blue or Green line. Both go through Shaker Square and into Cleveland. For eastbound travel: If you’re downtown, you’ll board at Tower City/Public Square. Your last chance to switch to the Van Aken (Blue) or Shaker Boulevard (Green) line is at Shaker Square; if you are in Shaker Square or any stop in Shaker Heights going east to a local destination, check the schedule for the times the east-bound trains leave Shaker Square. On the schedule, you’ll notice that neither the eastbound nor westbound timetables provide departure times for each and every station on the Blue and Green lines. Don’t be alarmed, because the departure times from the terminals are listed. You should anticipate the train to arrive within 10 minutes or so of leaving either Shaker Square, the Shaker Boulevard/Green Road terminal, or the Warrensville/Van Aken terminal. Of course, the closer you are to the terminals, the sooner the train will show up. So to be on the safe side, it’s worth getting to your stop at about the time the schedule indicates the Rapid will depart those stations. Find the full fare schedule at www.riderta.com/fares. The adult fare for a one-way ride on the Rapid is $2.50, regardless of how far you ride. 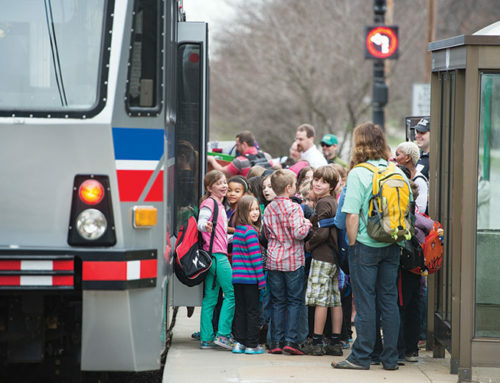 The fare for children 6-12 is the same as the adult fare, unless you do the smart thing and purchase a $2.75 all-day child’s fare (fare is valid only for children accompanied by an adult). Children five and under ride free. With a student I.D., the fare is $1.75 each way for children K-12; for seniors and disabled riders, the fare is $1.25 each way. Additional options include all-day passes (one, two, four, and seven days), five-trip fare cards, and monthly passes. 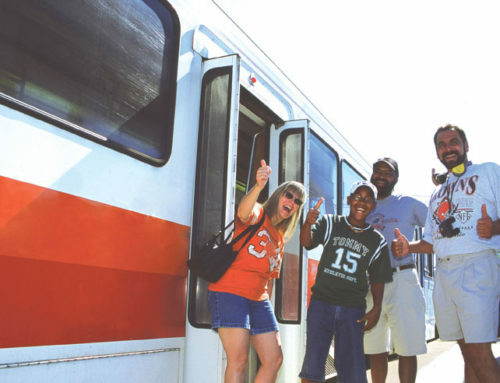 Hundreds of Greater Cleveland companies offer reduced-fare Rapid passes through the RTA’s Commuter Advantage program; colleges and universities also offer discounts through the Student U-Pass program. How to pay for a ride on the Rapid can be confusing. You can pay with cash on the train; with cash or debit/credit card at a kiosk; or buy tickets online with the RTA’s mobile app. Note, not all stations have kiosks. You will need exact change for the fare box on the train. A combination of bills and coins is acceptable. the fare box next to the conductor or show your mobile ticket. Be prepared to show ID for special fares (i.e. a student ID for the student fare). If you are riding the train to Tower City, you pay in the station at the kiosk after you get off the train (or show your mobile ticket when exiting). Eastbound Travel: Pay as you board the train. Again, if you board at Tower City, you will pay at the kiosk in the station. If you board elsewhere, pay at the fare box on the train or show your mobile ticket. Riders can also purchase fare cards in advance of a trip. These are available online at riderta.com or at Tower City and at Shaker Imports (16722 Chagrin Boulevard). Simply swipe the fare card through the fare box again as you leave the train traveling westbound or as you enter the train traveling eastbound (unless you are in Tower City, in which case you will do this at the station). For more information on how to ride the Rapid, visit riderta.com. There you can download maps and schedules, purchase fare cards and passes, and learn more about discount programs, such as Commuter Advantage and Student U-Pass. Or call the RTA Answerline at 216.621.9500.